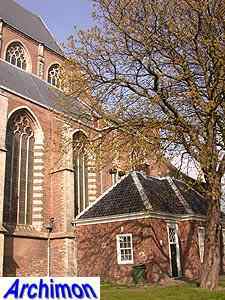 The Grote Kerk of Brielle is the town's main church and has been in protestant hands ever since the protestants conquered the town in 1572. 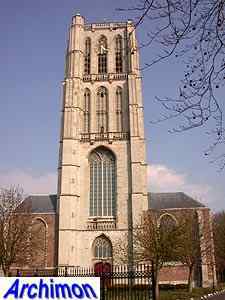 Despite its use by the protestants, the church is often called by its catholic names St. Catherijnekerk or St. Catharina. 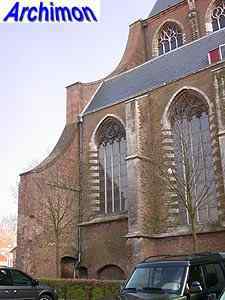 The church was preceded by a much smaller building from the 13th century, which in c. 1333 became a chapter church. 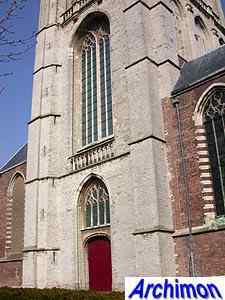 Little is known about this church, except that it had a wide trtansept and a straight choir to which a lateral choir was added in the 14th century. 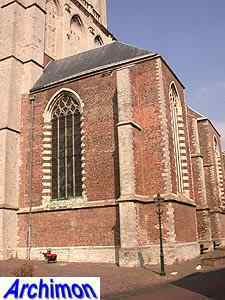 In the 15th century the old church was gradually replaced. 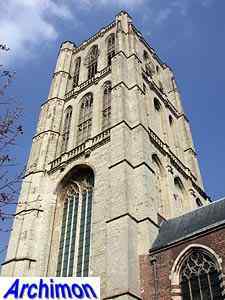 A first tower was built in c. 1417, but in 1456 it collapsed, presumably as the result of a fire which destroyed much of the rest of the church as well. 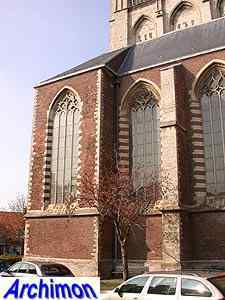 The current church was built between 1417 and 1482 and is a classic example of failed ambitions. Only part of the church was ever completed. 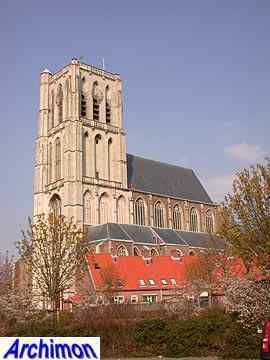 When completed, the church would have been a building of truly megalomanic proportions, the biggest church of the Holland region. 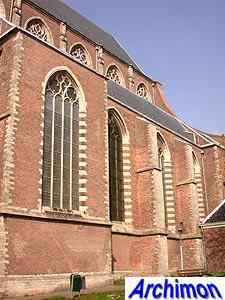 Traces of foundations of the missing parts indicate that the completed church would have been as big as the cathedral of Utrecht and the St. Jan in 's-Hertogenbosch. 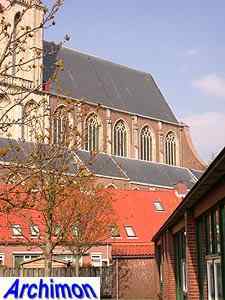 The width of the nave was bigger than that of any other church in The Netherlands. Traces show that the nave would have been covered by stone vaults, supported by flying buttresses. The tower was meant to be 120 metres tall instead of the current 60. 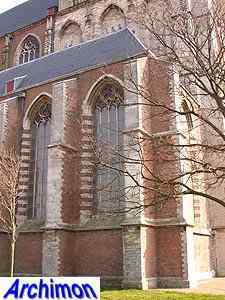 Like all other big churches in the Holland region in that period, the St. Catharijne was built in Brabantine Gothic style. 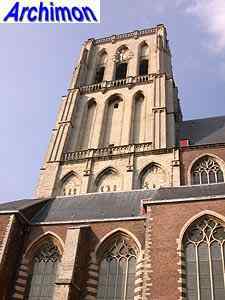 The nave was mainly built of brick, with details of natural stone, while the tower was entirely built of natural stone. 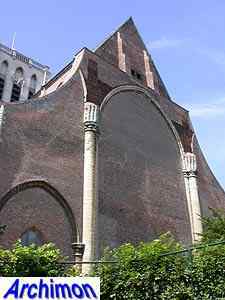 In 1456 a big part of the uncompleted church was destroyed by fire. Rebuilding started in 1456, but by 1482 there was no more money to continue. 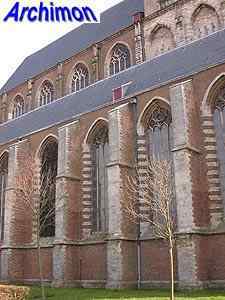 At that time only the nave was completed, a three-aisled construction with a wide central aisle and a tall clerestorey. 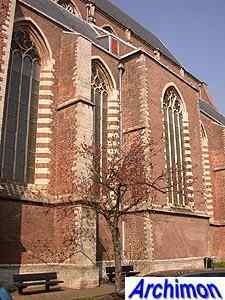 Although the old choir was rebuiltin c. 1460, this was meant as a temporary measure only; eventually its place would have been taken by the new transept. 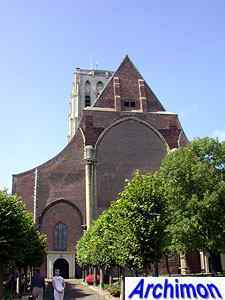 In c. 1500 work temporarily continued when the foundations of the transept were laid and parts of its western walls were put up. 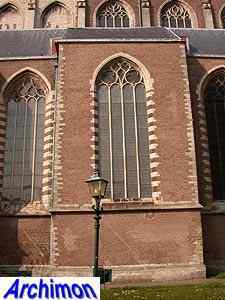 If completed, the transept would have been so big that a fairly big village church, including the tower, could fit inside. However, work soon stopped again. 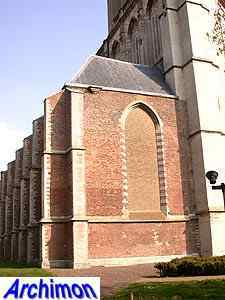 The unfinished transept-walls were given their current bell-shape in the 18th century. Work on the new choir was probably limited to some foundations. 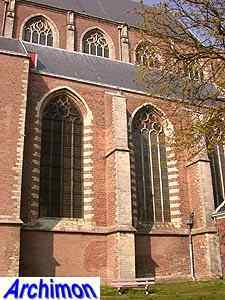 Instead, the arches on the east side of the nave were closed. Perhaps this was meant as a temporary measure, but work never continued. 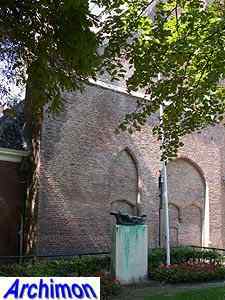 In 1632 the choir was demolished by the protestants, who had no need for it. In 1759 an octagonal dome was put on top of the tower, which was given a new use as a lighttower. This part was removed during the first restoration of the church in 1895-1901, led by J.Th.J. Cuypers. 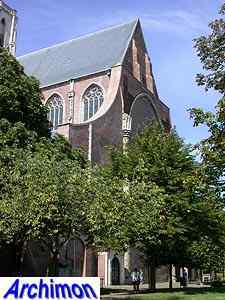 The resoration was continued by J. van Gils and lasted until 1929.